Keeping up a good level is always harder than reaching it. After a promising debut season, enabling Andrea De Cesaris to revive his F1 career, the German Rial team slipped back badly in its follow-up season. The victims of Rial's dreadful ARC2 were Christian Danner - a good number two to Roberto Moreno in his talent to end up with the right team at the wrong time (or the wrong team at the wrong time, for that matter) - and fellow German Volker Weidler, a gritty driver and the 1985 German F3 champ who had showed some promise in F3000. 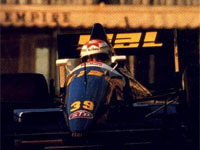 While Danner's entry was exempt from prequalifying due to De Cesaris's good showings in the latter half of 1988, Weidler was thrown in the deep end. With no F1 experience whatsoever Volker was forced to do the impossible: make the ARC2 work in just 30 minutes. Unsurprisingly, he wasn't up to the task. At his home Grand Prix he finally made the cut but was cruelly excluded after receiving outside assistance in one of the sessions. In Hungary he managed to prequalify again, only to finish up last on Saturday and to hear he was to be replaced by Pierre-Henri Raphanel. With understandably no F1 team waiting for his services, Volker found a new life in Japan, driving for the Mazda sportscar team. This was a rather more successful endeavour since he brought the marque's motorsport highlight of the century: winning the rotary engine its first and only enduro victory, co-driving Johnny Herbert and Bertrand Gachot to the big one at Le Mans. At the same time he became a force in Japanese F3000. But after several good showings for the Nova team he developed tinnitus, a strange hearing affliction which produces a constant ringing in one's eardrums. The noise became so bad that Volker was tragically forced to call it quits.